Many Animals were Exposed to the Spill Thick of Things courtesy of Ron Wooten on Flickr by permission. Grounded Fleet Deepwater Oil Spill Shrimp Fleet courtesy of Ron Wooten on Flickr by permission. Courtesy of John Amos, SKYTRUTH, MODIS/Aqua Detail (with interpretation), June 19, 2010. 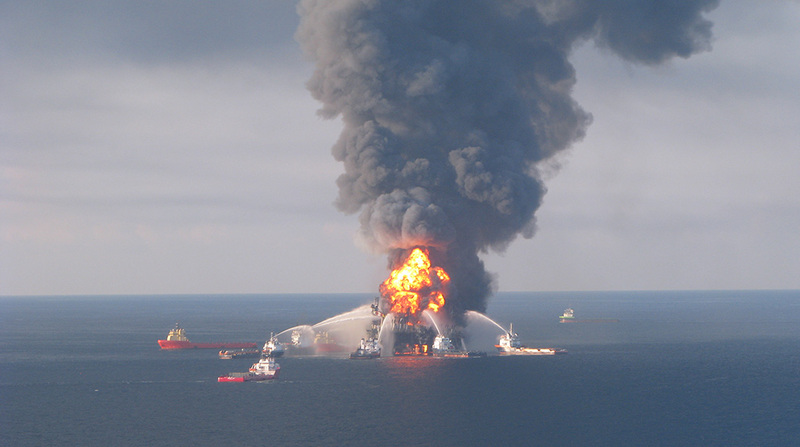 On 20 April 2010, the Deepwater Horizon drilling rig operating approximately 50 miles (80 km) off the coast of Louisiana at an ocean depth of nearly one mile (5,000 feet or 1525 m) experienced a catastrophic failure that ultimately resulted in one of the largest environmental disasters in US history and the world's largest marine oil spill. At approximately 9:45 p.m. local time on April 20, high-pressure methane gas from the Macondo well in the northern Gulf of Mexico expanded into the drilling riser and rose into the drilling rig, where it ignited and exploded, engulfing the platform in flames and smoke. Tragically, eleven men lost their lives in the explosion. The rig sank on the morning of 22 April. That afternoon, an oil leak was discovered when a large oil slick began to spread at the former rig site. The Macondo oil flowed from the well for 87 days. Although the precise daily flow rate has been disputed, the Flow Rate Technical Group estimated the flow rate was 62,000 barrels per day (9,900 cubic meters). The total estimated volume of leaked oil was approximately 4.9 million barrels (210 million US gallons, 780,000 cubic meters). After several failed attempts to cap the well, the flow was finally stopped on September 17, 2010. The petroleum that had leaked from the well before it was sealed formed a slick extending over thousands of square miles of the Gulf. 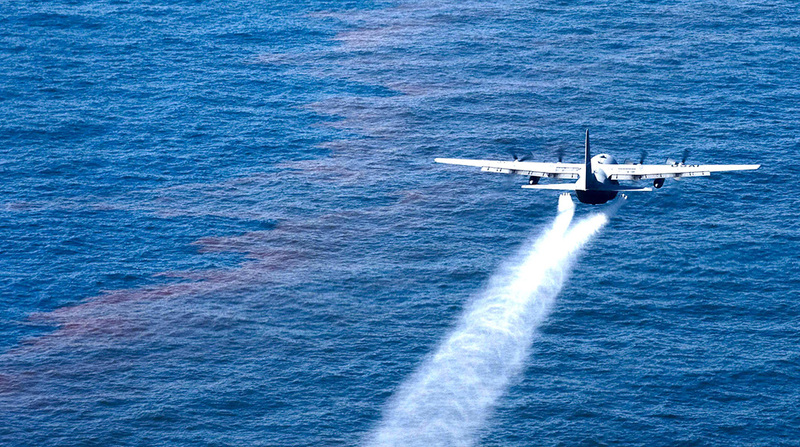 To clean oil from the open water, 1.8 million gallons of dispersants were pumped directly into the leak and applied aerially to the slick. Booms to corral portions of the slick were deployed, and the contained oil was then siphoned off or burned. 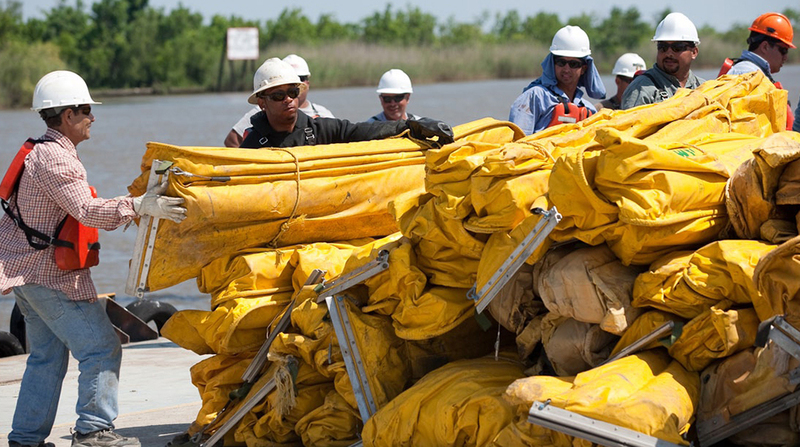 As oil began to contaminate Louisiana beaches in May, it was manually removed. Marshes and estuaries were more difficult to clean. By June, oil and tar balls had made landfall on the beaches of Mississippi, Alabama, and Florida. In all, an estimated 1,100 miles (1,770 km) of shoreline were polluted. 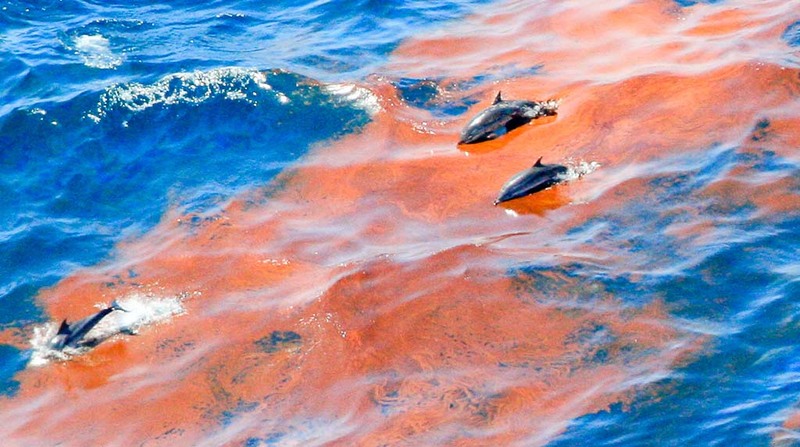 The consequences of the spill on the Gulf's ecosystems and human population were immense. Thousands of birds, mammals and sea turtles were covered with Macondo oil. Many perished immediatly; some were transported to rehabilitation centers for treatment. 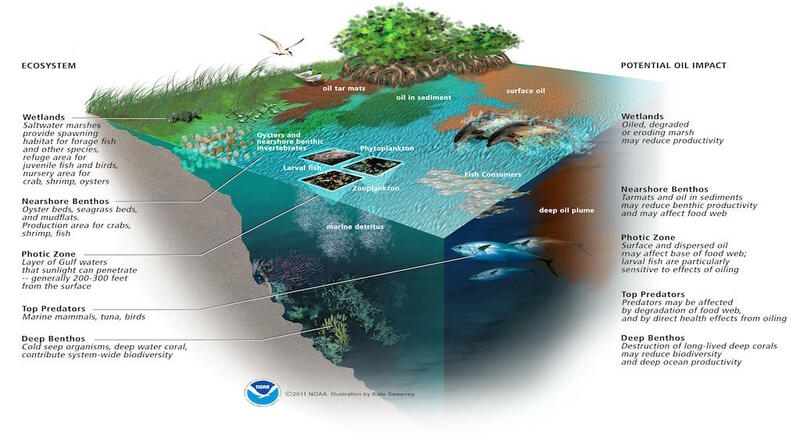 Scientists are still working to determine the impacts of the oil on the Gulf's ecosystem. 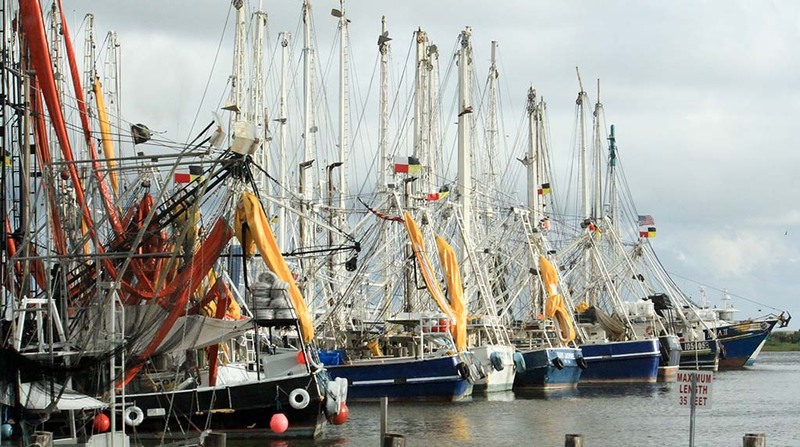 Livelihoods dependent on the Gulf suffered; people working in fisheries, oil and gas, and tourism were hardest hit. Today many in the Gulf Coast states are still struggling to recover from the economic damage resulting from the spill. 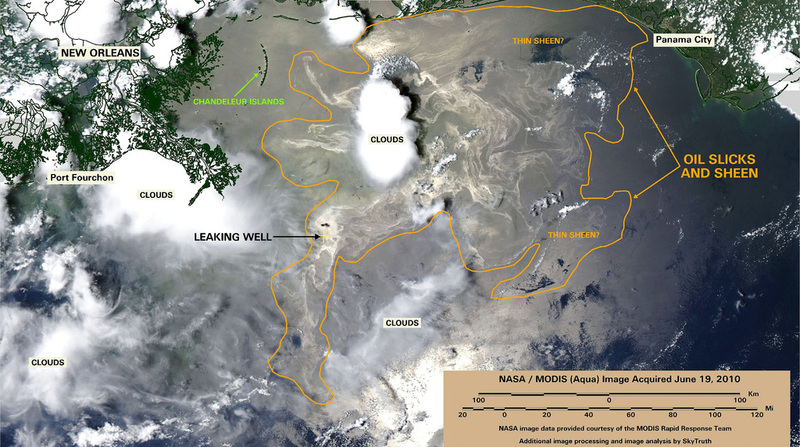 Much of the above information is summarized from the following website, which can also be consulted for more comprehensive and detailed information about the Deepwater Horizon spill, effects, and aftermath.